This is a gender reference guide for some of the more popular pronouns regarding those outside and inside the gender binary. What is this gender binary you ask? Gender identity goes way beyond girl and boy, it is otherwise known as outside the gender binary. Binary means two, which just refers to boy and girl. Binary, or boy and girl pronouns, are “she/her/hers/herself” and “he/him/his/herself.” While these are typically used, there are individuals who use various other pronouns. Pronouns outside the binary (or some of them) can be seen above. They may take some getting used to, but using the wrong pronouns for someone is also known as misgendering. The best you can do is practice and get used to them, rather than not trying and ending a friendship over someone’s identity. Hopefully one day we can to a point where when you meet someone and you say, “Hi I’m ___ and my pronouns are ___, what are yours?” While this may seem silly, since many people go by the binary pronouns, it would make a huge difference to those who do not identify with them. 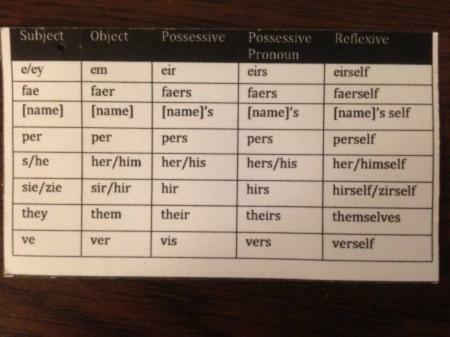 This would also make for lots of educational moments for those who are not aware of gender pronouns. It would hopefully be a snowball effect (for the better). Being introduced to pronouns can be a new experience and can take some getting used to. If you do mess up, the best thing you can do is apologize and correct yourself. It is important, if you recognize your mistake, to correct yourself, rather than just let it slide. This is someone’s gender identity we’re talking about and it means a lot to them for you to get them right. If you’re still a little hesistant to introduce yourself with your pronouns, there’s another form of visibility. The easiest one is adding to your email signature. Even if you don’t have a position that requires you to have a professional signature, it’s super easy to set up (or just write) “Pronouns:___” under your name.